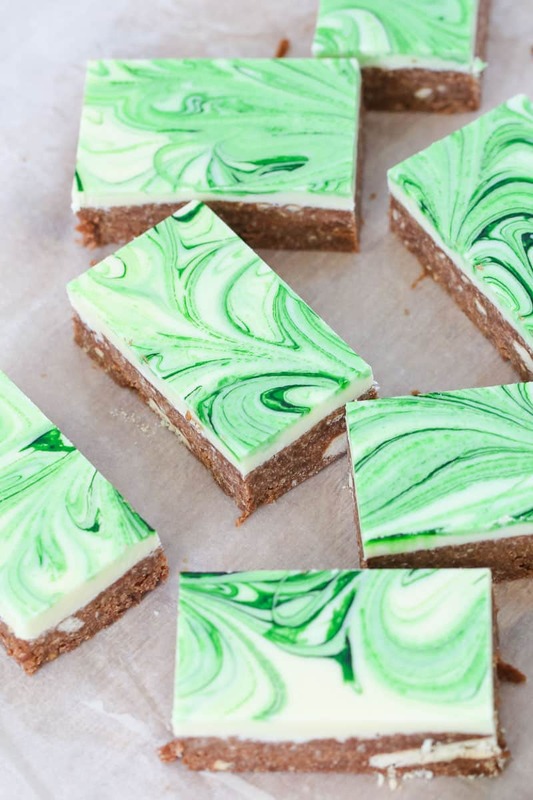 Our famous No-Bake Peppermint Chocolate Slice is now even better! A super easy sweet slice that only takes a few minutes to make! 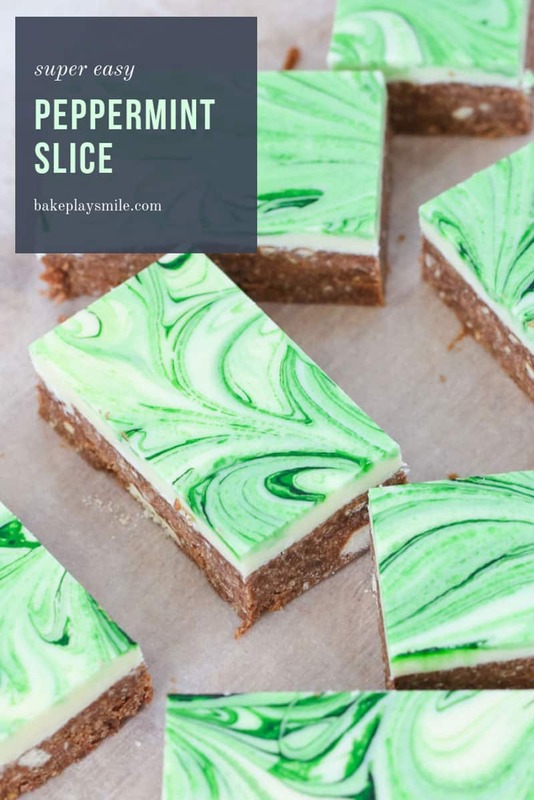 A few years ago I shared my recipe for Chocolate Peppermint Slice… and ever since, it’s been one of the most loved and popular slice recipes on Bake Play Smile. It also happens to be a MASSIVE favourite of mine! And so, the recipe has had a new little tweaks (including Thermomix instructions PLUS a video to show how simple it really is to make). This is going to become your new favourite slice (that is, if it isn’t already!!!!). Whether you’re making this slice the conventional way (either in the microwave or on a stovetop) or in a Thermomix, both methods are just as easy as one another. Either way, this slice will only take you 10 minutes to prepare and uses hardly any dishes… the hardest part is waiting for it to set! 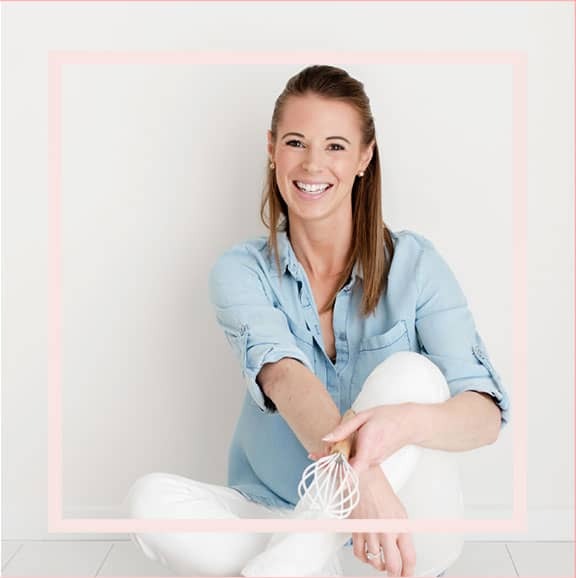 Scroll down to the bottom for the super easy conventional and Thermomix printable recipe cards. 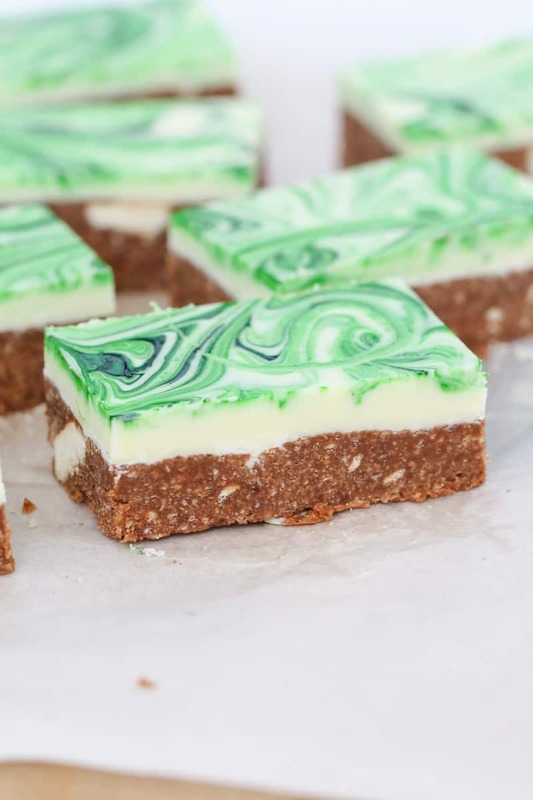 A chocolate swirled top layer is my absolute favourite way to finish a no-bake slice. It looks so effective but is actually really simple to do! 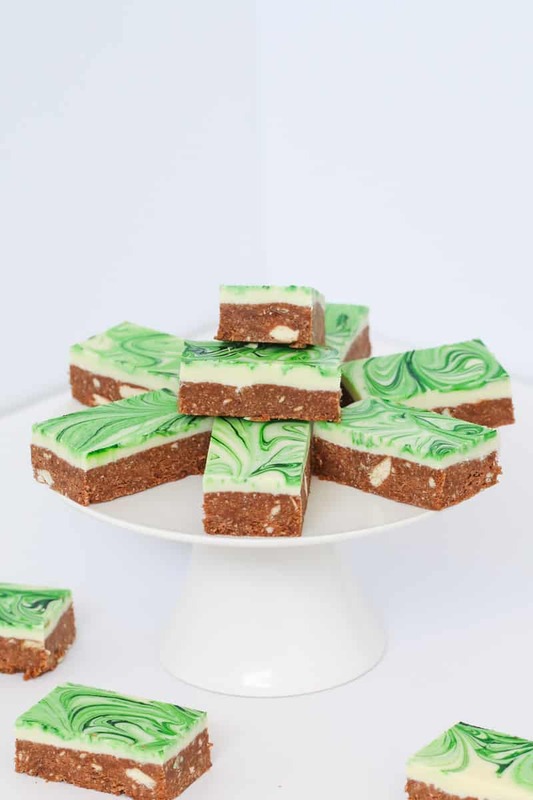 Add coconut oil to the white chocolate when melting (this makes it easier to swirl the food colouring through later on). Work quickly – you don’t want the chocolate to set while you’re still swirling! Add small (think… tiny!) 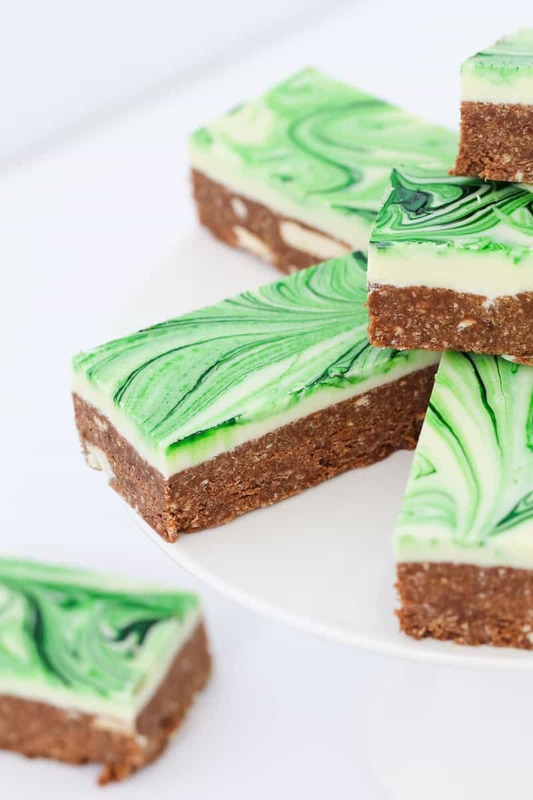 drops of food colouring all over the slice – if the drops are too big, they won’t set. Use a skewer or a knife to swirl the food colouring through in circular motions. 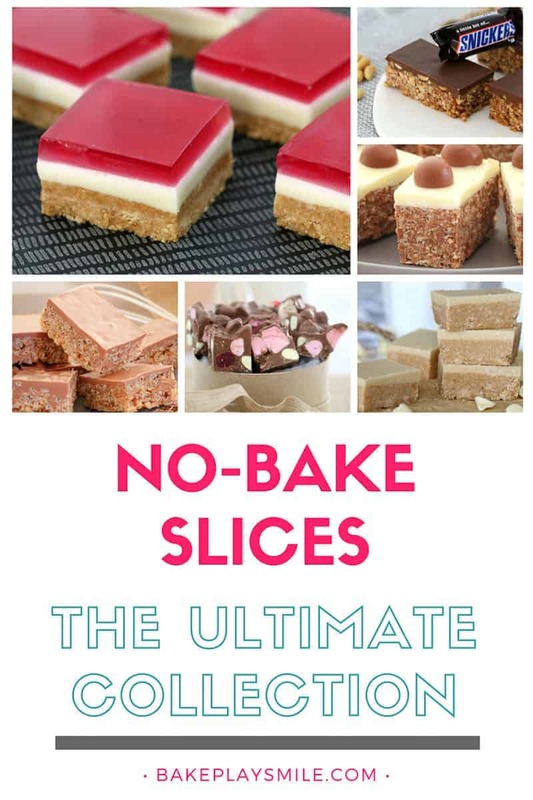 It’s no secret that I’m 100% obsessed with no-bake slices… so here’s a few more of my absolute favourites! Grease and line a 16X22cm rectangular slice tray with baking paper and set aside. Crush the biscuits in a food processor (leaving a few larger chunks). Place into into a mixing bowl. Sift the cocoa into the bowl. 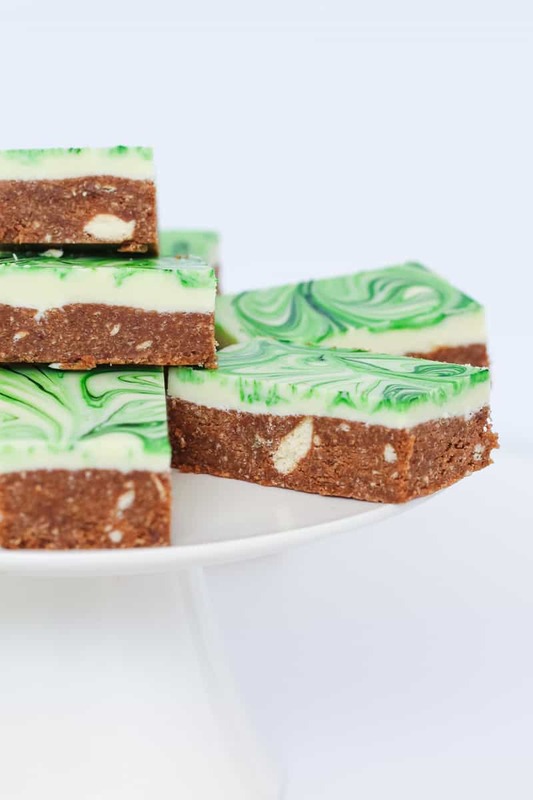 Melt the butter, peppermint chocolate and condensed milk in the microwave on 30 second bursts (50% power) until melted and combined - stir between each burst. Pour the chocolate mixture over the biscuit crumbs. Add the peppermint essence and mix well to combine. Spread mixture into a baking paper lined slice pan. Meanwhile, melt the chocolate and coconut oil in the microwave on 50% power (stirring regularly). Pour the melted chocolate over the slice. 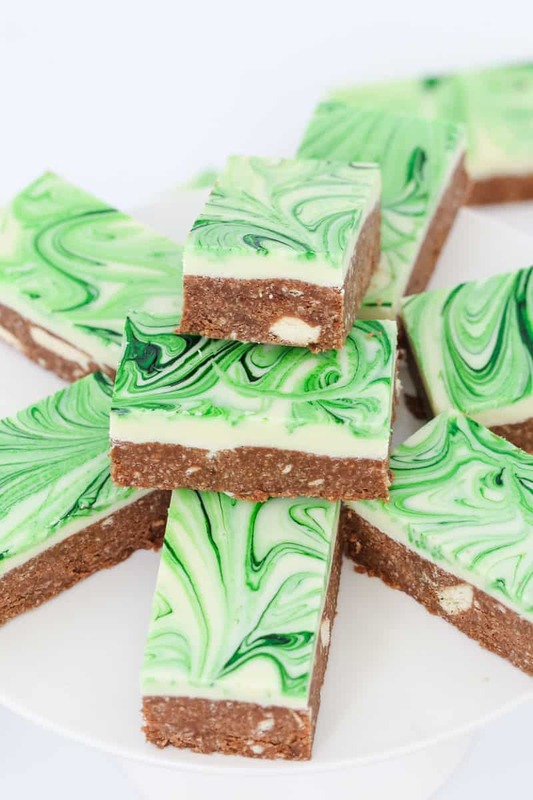 Working quickly, add a couple of drops of green food colouring to the white chocolate and swirl with a skewer. Place the slice into the fridge until it feels 'tacky' but the chocolate hasn't set completely hard. 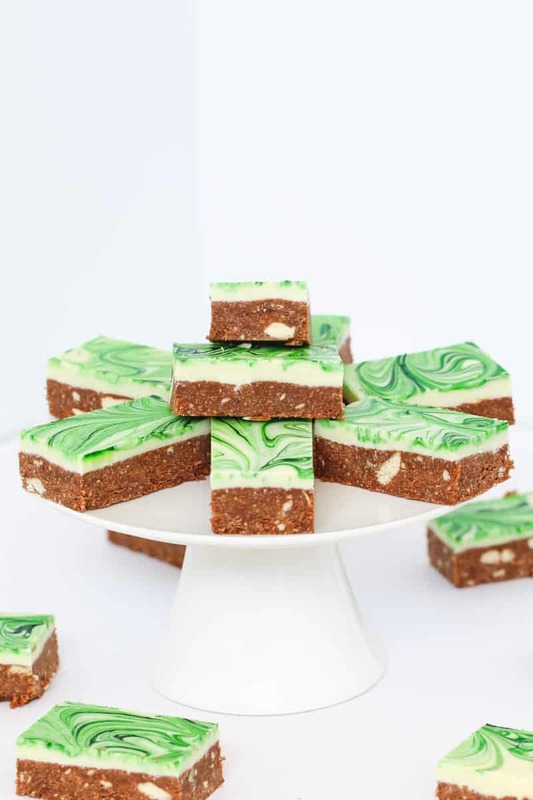 Take out of the fridge and slice into squares. I used Arnotts Marie biscuits in this recipe. You can use any plain sweet biscuits/cookies. Cadbury peppermint chocolate can be bought in any supermarket in Australia or New Zealand. 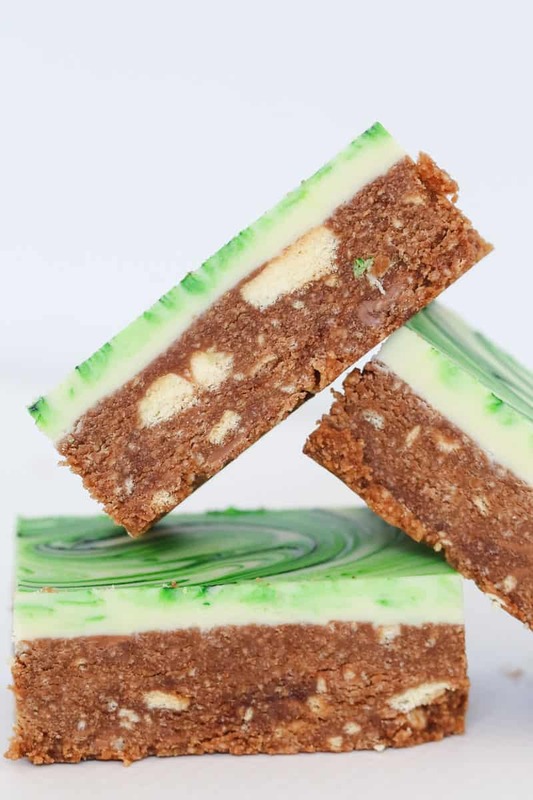 It has a milk chocolate outer layer filled with smooth peppermint filling. 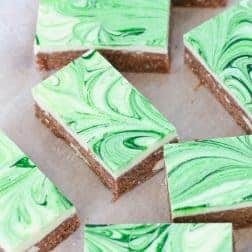 You can substitute for any soft filled peppermint chocolate block. Place the biscuits into the TM bowl and roughly chop by pressing Turbo 5-10 times (you still want a few larger chunks). Remove and set aide. In a clean TM bowl, place the condensed milk, butter and peppermint chocolate. Melt on 80 degrees, 3 minutes, Speed 2. Add the cocoa powder and peppermint essence and mix on Speed 5, 10 seconds. Scrape down the sides of the bowl. Add the crushed biscuits and mix on Reverse Speed 3 (using the spatula to assist) until combined. (You may need to scrape down the sides of the bowl and repeat). Melt the chocolate and coconut oil in a clean Thermomix bowl on 80 degrees, 3 minutes, Speed 2. Pour the chocolate over the slice.